Gates are a mechanical vehicle and like any vehicle they need repair, preventative maintenance, safety upgrades, repair when they are hit and occasionally it’s just time for a fresh look. Our team will walk you through your need to see if there is something we can do over the phone or send a technician by to diagnose the challenge and provide an estimate to do the work. 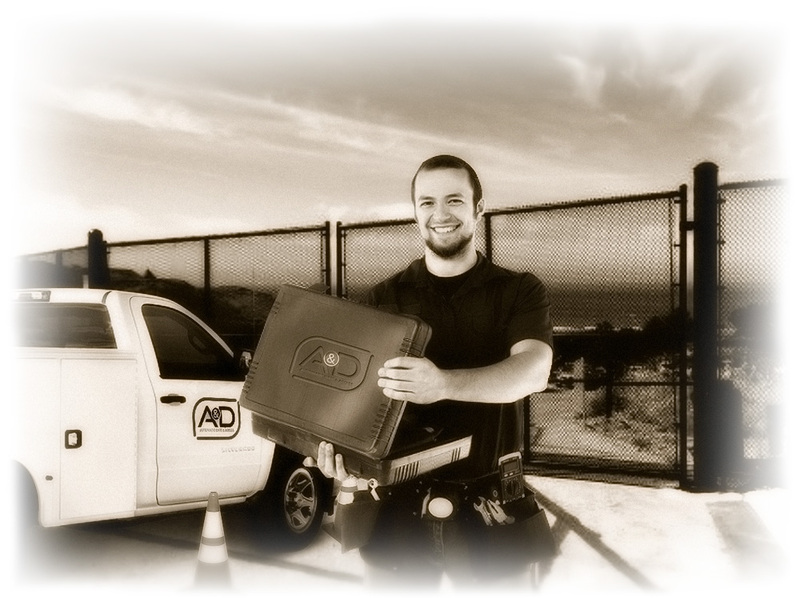 Here is a partial list of some of the services the A&d Service Team provides. Before You Call for Service consider these no cost tips to save a service call. Does your gate fail to open when you press your remote or Telephone Entry Service buttons? Action to take: First make sure there is power to the house. Then, make sure power is going to your gate by going to your home’s breaker box and insuring the breaker for the gate has not “flipped”. Try resetting the breaker switch for the gate. For safety reasons, do not attempt to get into gate equipment, this could cause injury or death. Also, if your breaker flips regularly, but resets the gate, contact us to look at the gate equipment to see if there is a problem with the equipment. Gate Telephone Entry System (TES) does not work. Go to gate and try initiating a contact as if you were a guest. If the call does not connect to the designated receiving device (phone or base station), insure phone line is working or cellular network is up and active prior to contacting A&D. Also, check to insure receiving phone is not on call forward. Gate companies cannot fix service to your home or mobile device but can replace equipment if line is working but equipment is malfunctioning. Most calls we receive on this are the result of the battery not working. This happens more often when remotes get cold in the winter. Replace battery and/or store remote in warm place. Like any electronic device, remotes have a useful life and need to be replaced. Contact us for a new remote or if a new battery does not seem to resolve your problem. Remember that like any other mechanical or electronic component, gates operate best and longest with preventative maintenance to insure that parts are moving efficiently. You must insure there are no insect or animal intrusions, dirt and debris must be cleaned from equipment and wires and backup batteries are in good order. Safety devices must operate effectively as well or gate could fail to open. Contact us to find out more about our quarterly preventative maintenance programs. Please provide your information below so our service team may contact you. We will get back to you within 24 hours or sooner. If you have an after-hours emergency (see note below) or would like to talk with our service team, please call us at 800-273-4283. Please note that assessment, troubleshooting or repair are subject to our standard hourly rate. We are interested in how we are doing, so please provide your feedback so we can continue to provide top-tier service. Please include property name if known, if unknown, please simply write "UNKNOWN" in the field. Please enter the actual address where our technician will provide service. Please provide the best number which will reach you fastest. We do not use your phone for marketing. Emergency Opening Services are provided after hours (before 7:30am and after 4:30pm) . After hours calls are guaranteed to open or close your gate but do not provide assessment, troubleshooting or repair services. Charges are based on portal to portal and require payment at the completion of the service.